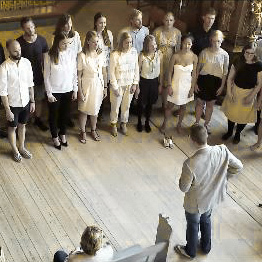 I have worked as a choral director since 2012 and currently lead the Copenhagen-based choir Røst. Typically I work with choirs that sing covers and original material with an ‘indie’ or ‘electronic’ sound and anything from four to nine parts arrangements. I have given workshops in different contexts, spanning from two-hour ‘inspiration sessions’ as an alternative to the regular weekend rehearsal, to whole-day sessions focussing on aspects such as groove & time, pitch & intonation, blend & timbre and interpretation & expression. From November 2015 to February 2016 I am arranging and rehearsing music for Hasseris Kirkes Ungdomskor, culminating in a concert in Viborg Cathedral.